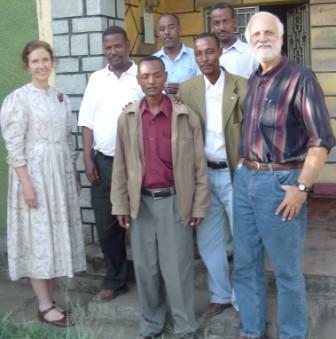 The organizational structure of the church body in the Ethiopian church is different than the “typical” American church body. Most American churches have a “senior pastor” – an individual who does most of the preaching, who superintends the various ministries, and who provides the vision for the church as a whole. Working with this senior pastor is a team of laymen who are elected by the congregation to assist the pastor. In larger churches there are “professional” ancillary pastors for youth, music, children, etc., as well as another team of laymen and/or women elected to do logistical functions. American churches usually are involved in mission outreach by delegating such work to cooperative programs or independent mission organizations. 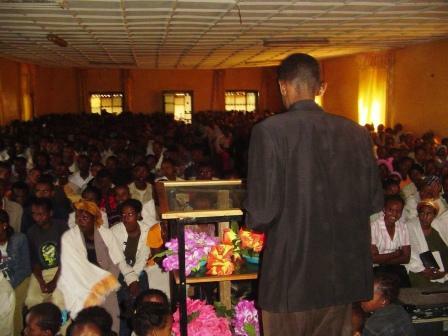 T he evangelical church in Ethiopia is much smaller and younger than the evangelical church in America. As such, her church ministries are less “professional” and “bureaucratic.” The churches with whom we work in Burji and Alaba as associated with the Kale Heywot fellowship of evangelical churches. This fellowship is the outgrowth of the mission work done by the Sudan Interior Mission (1940-1970s). 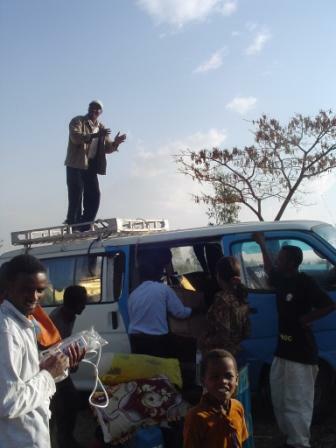 It has a central office in Addis Ababa, regional zones, and then district levels. The central and regional zones serve to coordinate mission outreach to unreached people groups, assist with advanced Christian education, etc., among the various churches. Workers in these offices are great resources to the district churches. At the district level, there is a mother church; this is usually the largest and oldest church in the district. And it is from this mother church that all the other churches in the district have come. In the Alaba district, the Alaba Town Church is the mother church. This church began meeting with 3 people in the home of Workenish and Gurach in 1969. In 1972 they acquired property; 33 people were attending at that time, mostly transplants from other areas where Christianity was already well established. Today this mother church has hundreds attending on a Sunday morning. It has established 3 other churches in Alaba town and quite a few smaller rural congregations. It also has a K-4 Christian academic school (with about 50 students) and a 2-year Amharic Bible School (with about 12 students). Every 3 years the congregation elects 7 lay leaders. These leaders, according to the Scriptures, are “apt to teach” and have demonstrated spiritual maturity. Teaching on Sunday in services is rotated between these leaders; they also direct the overall ministry of the church and its various outreaches. For its ministry and outreach, the leaders have chosen 14 “evangelists.” Three of these are administrators; the rest are mobile preachers. They are roughly the equivalent of the itinerant preachers in America 100-150 years ago. They are appointed certain sections of the district, and they travel by foot (or sometimes bicycle) between the villages preaching, teaching and doing various Christian ministry. They are a tough breed, these evangelists. They push their bodies to do without food, without water, to walk hours on end in the hot sun to reach a village, to sleep anywhere available to them. They push their emotions, willing to suffer ridicule, willing to forego marriage, willing to be separated from family, coping with fear and loneliness. They push their spirits, dealing with the curses of witchdoctors and the aggressive persecutions of Muslims and Orthodox. When they are sick, there is no sure access to doctors or medicine. When they are cold or tired, there may be no blanket or resting spot. They live “on the edge” for the Lord’s church, braving new spiritual territory to plant churches. On this recent mission trip, Dave and I saw these evangelists up close and personal. Let me introduce you to three of them. 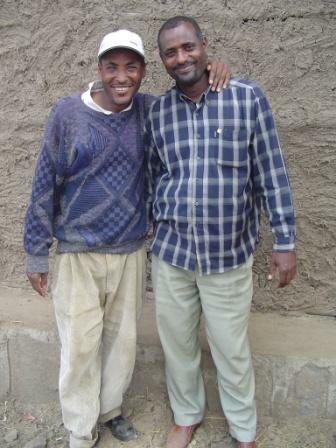 Evangelist Shifara comes from the area near Keranzo; he was raised in a Christian family, which is highly unusual. He’s about 45 years old, and is married with 4 children. Five years ago he gave up a profitable business to become an evangelist. Like most Ethiopian women, his wife is a full-time homemaker. After release from the prison, one night Shifara was coming to the church to pray. Hajji Mohammed and a little band waited to ambush and kill Shifara. They beat him with sticks and knives, stabbing him all over; he showed me some of the scars. They left him for dead, but God revived him. Now they embrace each other as brothers in our Lord’s family. I asked him about his salary as an evangelist. He told me of a group of Christians in the Town Church who had formed a sort of “club.” They had made a commitment to give over and above their usual giving by doing without food one day a month in order to support Shifara. This club (which includes men, women, and children) originally had 250 members, but due to financial hardships, it now numbers only 170 members. He said that he ministers around the district, traveling long hours on his bicycle. His wife and children live in town; usually he sees them once or twice a week. Coming up next: Taking Care of Each Other (Continued).